Cub Editor is an MS Access Report formatting wizard that allows MS Access developers, or end-users to easily create or modify attractive report layouts based on existing tables or queries. Cub Editor looks and behaves like the MS Access report wizard, only itâ€™s better because it gives you more control over the report formatting process, and because it allows you to change the layout of existing reports. Inserting a field into a report with Cub Editor is a simple matter of dragging and dropping a field name from one list box to another. Cub Editor adds the appropriate controls to the report header, detail, and footer sections and then evenly spreads report controls horizontally across the report. So, you no longer have to make never-ending adjustments to â€œstraighten outâ€ report fields. Also, Cub Editor will automatically compute how wide a report control should be in order to fit all, or a majority of the values contained in the field. So, thereâ€™s no more guesswork, or trial and error needed when deciding how wide to make a particular report control! 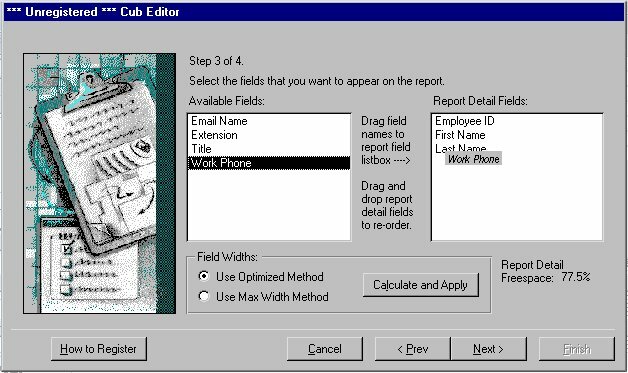 When you combine Cub Editor with Cub Reporter (another product available from Peterâ€™s Software â€“ http://www.peterssoftware.com/), you have a huge application development time-saver, and are within armâ€™s reach of â€œletting the users create their own reportsâ€. Also available for Access 2000, and Access 2002. Cub Editor is an MS Access Report formatting wizard that allows MS Access developers, or end-users to easily create or modify attractive report layouts based on existing tables or queries. Looks like the MS Access report wizard, only it's better. Mit Ihren bisherigen Lottozahlen haben Sie noch keinen Jackpot geknackt? Die Geburtsdaten Ihrer Lieben bringen Ihnen einfach kein GlÃ¼ck? Dann probieren Sie doch einmal aborange LottoMaster aus! Auch fÃ¼r Keno und Toto. The Quicky Password Generator is fast, efficient, and small. It maintains separate groups of 100,000 passwords at a time of 4 to 20 characters. The passwords are displayed and can be copied to your clipboard easily or exported to a file. Haunted Halloween email stationery based on illustrations by Dennis Cox features a fun variety of email stationery! Selections include Witch, Pumpkin Spook, Happy Drac and many others. Easy three step instructions for using with your email! Icons from File extracts icons or icon arrays from files (EXE, DLL, OCX, etc.). Can scan folders and search for EXE, DLL, OCX files, which contain icons. Extracted icons can be printed or saved to ICO, BMP, JPEG, EMF, GIF, PNG, HTML, and DBF files. Import Wizard enables you to easily import text files into MS-Access, Excel, MS-SQL Server, MSDE, MySQL, or other databases. The software allows complex text imports such as multiple lines per record and headers and footers. Screensaver randomly draws geometric shapes and fills by using the random brush. There are several filled shapes: triangle, rectangle, ellipse, pie, chord and polygon. SmartSync Pro is a universal solution to back up and synchronize data to a local or external drive (Flash/ USB/ZIP, CD/DVD, NAS etc) or even remote PC. Task scheduler, data compression, activity logging and password protection are available. CheckOsVer is small, free program which will report your Operating System Version and also the version of the Windows Common Controls installed on your Windows PC. Totally redesigned, the new Church Secretary for Windows 2014 includes an event calendar, dashboards for spotting attendance and contribution trends and much more. This site does not contain serial number, crack, keygen Cub Editor for MS Access 97 serial number : serial number is the simplest type of crack. A serial number(cdkey,product key,etc) is register the program as you may already know. a crack or keygen may contain harmful software. If you cannot find the exact version you want, just give it a try. for more information read .nfo/.txt/.diz file include in zipped file.